When it comes to making the most savory sauces, creamiest soups or delicious pies, Rapunzel's Organic Corn Starch is the best for your recipe! Doubles the thickening power of flour and is sure to mix up well in your favorite dish or dessert. A must-have for those who do a lot of cooking from scratch. 8 oz. box contains around 30 tbsp. $4.49 each. 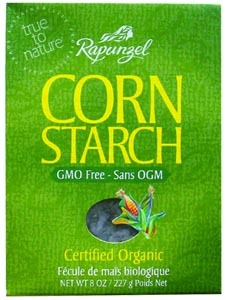 Finally the search for organic corn starch is over! From Bky of Santa Monica, California on 1/4/2009 . This works just the same as the old gmo /chemical infested stuff with out all the undesired "extras". I try to use only organic ingredients but corn (and soy) are the two that I try never, ever to use in non organic form - this cornstarch has brought happiness back to the kitchen ! thank you! Allergen This item is manufactured in a facility that also processes wheat (gluten), dairy, and soy.